TarotSeek™ – A revolutionary unbiased and objective self-tarot reading system. TarotSeek™ is a physically different way of reading tarot cards for the 21st Century. 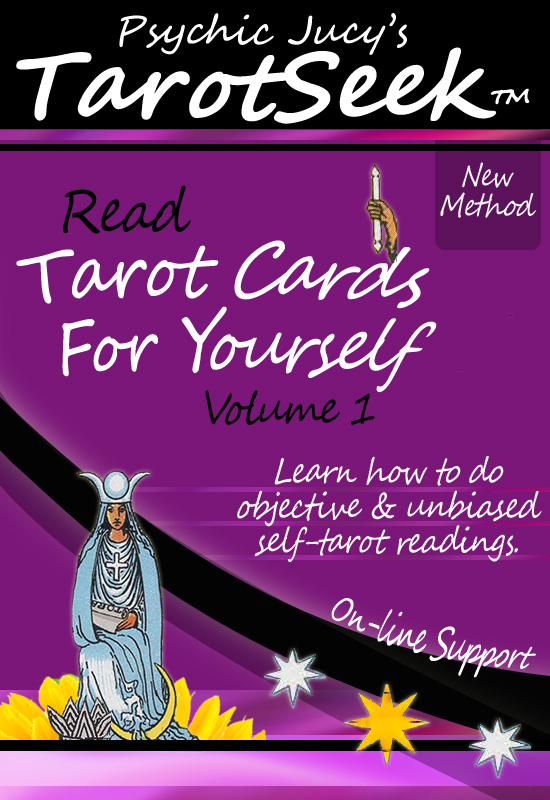 If you’re seeking an innovative, objective, unbiased, and successful approach to self-tarot reading, whether you are a novice or a professional, this guide is for you. However this guide is NOT a long-winded book about what the cards mean, layouts, history, mythos, or the magic of tarot. This guide is for you if you don’t have the time or desire to spend hours, days, and months learning how to read tarot for yourself. And it’s not for you, if you’re seeking a ‘complete how-to tarot book’ that takes some time to get through. There are plenty of these wonderful books already available. Who needs another one? Connect with other TarotSeek Readers and get additional advice and help with your readings by signing up to the *TarotSeek VIP Tips Newsletter*. This self tarot card reading system was created by a certified professional tarot reader and tarot teacher. It’s unfortunate that these Negative and Deathly predictions have been posted to such a reputable paper. As a professional psychic, I am often under the (rightfully so) questionable eyes and ears of people and it’s, in part, due to this type of negative media exposure. In the past, I have been asked by reporters to do a piece on predictions and because my predictions are in large part — POSITIVE — I don’t get printed and they move on to something more sensational. What is wrong with this world? This reporter or their editor would not have run this article if it wasn’t going to get the interest of the papers’ readership! Now, in regards to predictions… Just because I’m a psychic, it doesn’t mean my “only” value is as a predictor or forecaster. In fact, I’m often not very good at “general world” predictions anyway. “What? !”, you say? Yes, I can be a very good psychic and not do very well at general predictions. “Well isn’t that your job my dear lady?” Not quite. My value is in seeing the past, the present, and the possibilities of the future. My value is in giving insights, reporting on my observations that are so plain to me but not often to others, support, care, and common sense advice. It’s also in the ability to listen deeply and to pull positive solutions from my right brain (the universe) to help another have more positive futures. My focus is on the freewill of the seeker. If they don’t like what I see, they can change it with often an incredible amount of hard work. But it doesn’t take a psychic to predict that a lot of people don’t like working for what they want or need and that if you keep doing what you have already done, you are going to get more of the same. Plainly, people have a hard time doing what’s good for them and they will often use a psychic as a scapegoat to explain away the bad things that happen/ed to them. This is a hazzard of my job and a money break for unethical psychics praying on the vulnerable. I say: Let’s put these kinds of psychics out of business. Go to a Crisis center or work with a licensed professional when in a seriously emotional state. And like the weather or a sports forecast, a psychic prediction can have a way of not coming true if it is willed and sometimes that’s a very good thing. Positive protective vibes wrapping around Obama — Long Live Obama!! Heh, if skeptics want to try me out on my FREE reading days — just sign up to my Free Psychic Reading Days newsletter so I can alert you of my last minute freebies and give me a go. Please do not clump all psychics together. We, as you, are unique individuals. Ask for their rates and when you can get an appointment. Question anything directly related to the service provided. Do not go into your questions or concerns in a reading sort of way. Briefly state your concerns and leave the rest for the reading. Be respectful of the readers time. A phone appointment request should last no longer than 3-5 minutes! Anything more is a reading. 1 Do not wait until a crisis before you hire a psychic. If they are busy, it can cost you more and they are not prepared for you. If they are not busy, are they any good? 2 If you have a personality disorder, sort that out first OR advise the psychic you have a “mind challenge”. If the reader is willing to give you a reading, don’t put your disorder onto the psychic — respect and know your limits and the readers too. 3 If you have a desire or want, ask FREEWILL questions. If you have no control (i.e. things are already in motion), ask DESTINY questions. Freewill questions allow you to happen to life. Questions are focused on “how, what, why,” and options to take. Destiny questions allow life to happen to you. Questions are focuses on “when, who, where, if, will) and supposes you have no control.